World-leading weather scientists from the University of Reading have been following the path of one of the biggest storms to hit the South of England for several years. High winds and heavy rain battered southern parts of the UK, causing travel disruption to Monday morning commuters. Here, some of our scientists explain what was going on. How well did the forecasters do? Dr Helen Dacre has been following the development of the storm. She said: "Forecasters have learnt important lessons since the Great Storm of 1987, both in terms of the atmospheric physics, and in how to communicate warnings to the public. Better forecasts meant that the emergency services, transport bosses, employers and the public were given every chance to prepare. "The fact that the Met Office was pretty accurately predicting the path and scale of this storm and issuing advance warnings on Thursday last week show that meteorology has made huge advances since 1987. "These days, the Met Office uses more than 10million observations a day, and we no longer have the same lack of data from the North Atlantic that previously caused problems for forecasters. Today, four-day forecasts are as accurate as one-day forecasts were in 1987. "Our ability to predict and understand storms has improved enormously in recent years. More powerful, higher-resolution computer models, sophisticated real-time measurements from satellites and networks of remote ocean sensors have all helped to make forecasting storms more accurate." Was it as bad as the Great Storm of 1987? 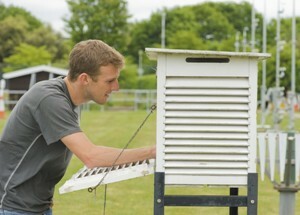 Dr Roger Brugge has been monitoring the situation at the University of Reading's own atmospheric observatory. "There were some strong gusts of wind across Southern England, with gusts of 99 mph on the Isle of Wight. Elsewhere strong gusts of up to 80 mph appear to have brought down trees, causing travel problems for many commuters," he said. "The storm doesn't seem to have been as damaging as had been expected earlier in the weekend. The storm system was still developing as it crossed the UK, and was not quite as deep as expected as it moved inland. In addition, the public had been well-prepared in advance. "We came off lightly by comparison to the storm of 1987, when we had gusts of more than 100 mph in places and many more trees brought down as a result." ‘Bombs' and ‘sting jets': what was going on inside the storm? Dr Oscar Martinez-Alvarado and Dr Laura Baker have been looking at what was happening inside the storm. With colleagues, they have studies similar cyclones using sophisticated numerical models and a research aircraft, flying directly into the eye of the storm, to find out what goes on inside this type of storm. "This cyclone was just short of a meteorological ‘bomb'," said Dr Martinez-Alvarado. "The atmospheric pressure at the centre of the storm dropped rapidly as it approached Britain, but not quite fast enough to be classified as a ‘bomb' - however, this still indicates a powerful and rapidly deepening cyclone. "Early reports indicate that conditions were right for a damaging ‘sting jet' - a damaging ribbon of high-speed wind which develops high in the atmosphere and lashes the surface below, as the cyclone passes overhead. "The storm is expected to keep deepening during the day. Scandinavia and northern Europe are likely to suffer devastating effects, as the cyclone reaches Denmark around noon today." How could climate change impact future storms in the UK? "We are learning how climate change could alter the number and types of storms which affect Britain," said Dr Dacre. "While it's still very difficult to be certain, early work, cited in the recent IPCC fifth assessment report, suggests a warming planet could lead to changes. In the future Britain could experience fewer storms overall, but when they do happen there is some suggestion that individual events could be more intense and damaging."